I am by nature a hoarder. As much as I admire a minimalist look aesthetically, it is not in my nature to have it. I love collections. It’s amazing to me how one marble on its own is just a marble but put in context with 20 other marbles of different sizes and colors, it becomes art. I am also sentimental. Like Ma’s China Doll in Little House on the Prairie, having talismans from my past gives me a a sense of belonging and security. 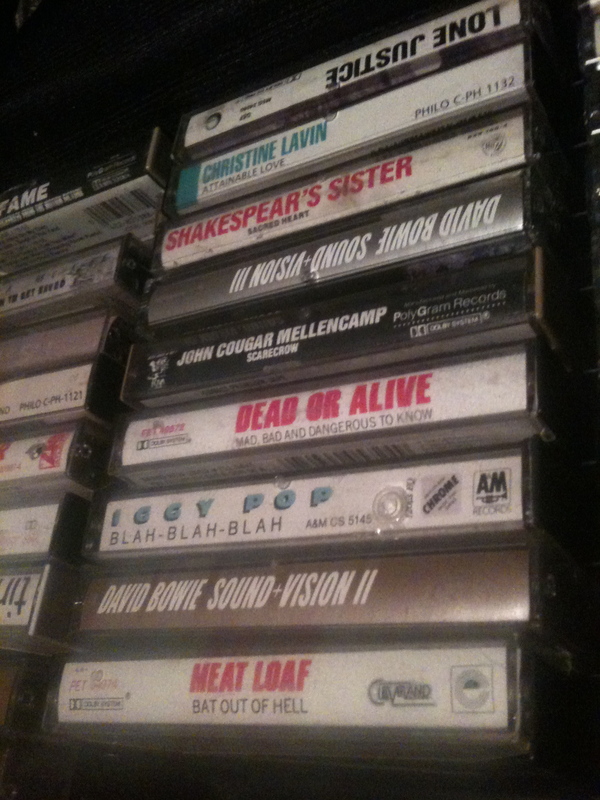 I found a box of old cassette tapes recently. There’s no reason for me to have them. I own most of the music on CD and don’t have a place to play a cassette. But just looking at them gave me a welcome snapshot of my life twenty years ago. I’m also the grandchild of immigrants, practical people who thought that the pain of shlepping things was worth not having to buy them again. My great grandmother shlepped a feather bed across the ocean in case she needed to hide her children from the Cossacks here, too. What? Just because it was a new country she should have to buy a new feather bed? One of my favorite places in my parents’ house is their attic. It’s been cleaned and organized in recent years but it is still a veritable store room of my childhood and young adult years. When we stay at my parents I go up to the vast attic and bring down to my children the same Legos and building blocks that I played with at their age. My prom dress hangs in a closet and Fred and Ethyl, two Easter Island-esque decorations originally belonging to my college roommate have a home. While my own house isn’t as big as my parents, it does have an abundance of storage space and so for the most part we keep stuff. Sometimes it pays off in unusual ways. Out of nowhere my children will start playing again with a toy long past it’s suggested age. When they rediscover an old toy they often find a new, interesting way that wasn’t on the long discarded box. A bath toy becomes part of an experiment in floating and sinking. Foam building blocks meant for preschoolers become part of a complex machine that would do Rube Goldberg proud. My daughter recently rediscovered her Backyardigans DVDs, a favorite from preschool. She’s watching them again and enjoying them on a whole new level. She’s enjoying them on their own merits and remembering how much she enjoyed them as a preschooler. Together they’re reminding us of her preschool years. But throw it in the box they do and on Saturday another child will come and see something important in that pink plastic wand. A pregnant woman will pick up “The Baby Whisperer” and think she’s discovered the secret to parenting. The good thing is that by design or carelessness some things will stay. A toy no more special than any other will not make it on to the yard sale table so that one day it can become a talisman of safety and security for its owner.